The Bhoota dance of Karnataka is one of the examples of trance dances. Bhoota means a spirit. 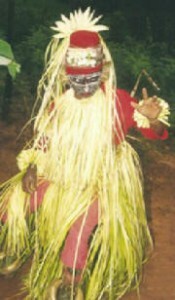 In South Kanara, especially the Tula community, perform this dance. They believe that there are particular spirits who if invoked to enter into the body of the dancer, many evils and calamities that may befall on the community will be averted. Almost every village in the South Kanara district has a Bhoota Sana. Derived from the Sanskrit word sthaana, Sana means a place. Surrounded by thick bushes and trees, stands a small structure with tiled roof and without any windows. In front of the structure there are a few T-shaped poles. Inside there are a few brass images suggesting human and animal figures. This is the Bhoota Sana, the abode of the spirits. There are also swords and flywhisks. The images are worshipped with only kapala flowers. The dance is performed on moonlit nights. The Bhoota dancer wears a highly stylized make-up and costume. There are quite a few variant forms of the Bhoota dance. In some variant styles the dancer, instead of stylized facial make-up, wears a wooden mask. The flowing skirt of the Bboota dancer is made of strips of palm leaf. The torso is covered with broad necklaces of nuts and beads. The dancer wears a conical headgear decorated with tinsel and tiny mirrors that dazzle when light falls on them. The face is given a mask like make up with lines that give the face a kind of weird look. The accompanying music is very loud and is provided by drums, pipes and brass clappers. The music is punctuated with prose passages. When the Bhoota dancer gets possessed by the invoked spirit, he tells many things of past, present and future. According to his advice even some village disputes are settled. The deified dancer promises prosperity for the villages and finally pronounces that the tradition will be continued for ever.